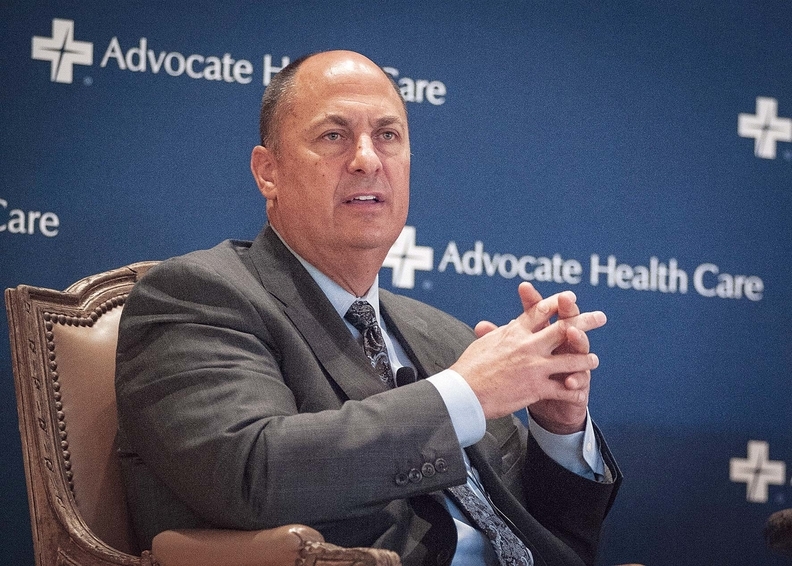 James Skogsbergh is of CEO of Advocate Health Care in Downers Grove, Ill.
James Skogsbergh, CEO of Advocate Health Care in Downers Grove, Ill., began his one-year term this month as chairman of the American Hospital Association's board of trustees. In an interview with Modern Healthcare editor Merrill Goozner, Skogsbergh, a former college baseball player, didn't duck the high hard ones on the challenges facing the AHA and Advocate's proposed merger with NorthShore University HealthSystem in Evanston, Ill. The following is an edited transcript. Modern Healthcare: What are your goals, and what do you see as the most pressing issues for the AHA this year? James Skogsbergh: This is an unusual year for the AHA because it's a year of transition—Rick Pollack's first full year as president and CEO of the AHA. So a big part of this year is really making sure that transition is smooth and seamless. We on the board really appreciate Rick's willingness to pause and re-examine the way the organization is structured. He has our full support to do that. Beyond that, the goals continue to be the same—to advance the field in terms of what we oftentimes refer to as the triple aim, making sure that the field is moving toward better health outcomes, better service and lower cost. MH: Your year is going to bridge a transition in the White House and a possible change in control of the Senate. What do you see as the greatest threats to the healthcare sector from a political transition? Skogsbergh: Unfortunately, despite all the rhetoric, we all believe that healthcare has a bull's-eye on its back. There is so much spent in this country on healthcare that we do fear significant cuts in reimbursement, which would create tremendous stress and strain on all of our nation's hospitals' ability to care for their communities. MH: The political emphasis is on repealing and replacing Obamacare, which could affect the exchanges and Medicaid expansion. How do you view those issues? Skogsbergh: The rhetoric is sort of strident about repeal, replace. I might be naive (but) that's much easier said than done. I can't imagine that there are too many Republicans, let alone Democrats, that really want to turn 40 million Americans out on the street and take away their coverage. There may be some modifications. But the notion of replacing and fully repealing is highly unlikely. MH: If the Republicans take the White House and maintain control of Congress, we could see a shift to tax credits for people who don't have healthcare insurance. Skogsbergh: I view that negatively, largely because of the increased amount of out-of-pocket (expense), whether that be the premium itself or the deductible or the copay. It is becoming such a burden that it often ends up in bad debt for our nation's hospitals. We consider that to be of great concern. But at the same time, there is some value in that notion of personal responsibility, both in how we care for ourselves—my choices that I make—and some financial responsibility as well. Where that fine line is, I'm not quite sure. MH: A few years ago, Advocate Health Care instituted a clinical integration program. How is that working out? Skogsbergh: We have stepped off of fee-for-service and moved into fee-for-value. That doesn't mean that all of our contracts are fee-for-value, but now a majority of them are. We've reached that tipping point at Advocate. We saw a situation five years ago where we had the same scene playing out time after time, in which the contract with insurance companies would be up and they'd be saying, “You're too expensive,” and we would approach it by saying, “We're not being paid enough.” There's this brinkmanship, and it really wasn't working for us, and it wasn't really working for the insurance company. So, credit to Blue Cross of Illinois, we suggested, “Let's just step off of that path and go down a new one,” and they were willing to do that. So, we created at the time a fairly innovative approach in which we would get paid for better health outcomes at a lower cost. Now there are a lot of contracts that have that mechanism in them. We're proud to say that at Advocate Health Care, our cost per discharge today is less expensive than it was five years ago. I'm not sure there are a lot of healthcare organizations that could say that. Listen to the full interview with James Skogsbergh. MH: Is this leading you in the direction of taking direct risk for 100% capitated payments? Skogsbergh: We already have full capitation. In the late '90s, we purchased Humana's clinics in Chicago, so we inherited full-capitation risk contracts, and have been operating that way for a segment of our population for almost two decades. We're familiar with it and moving more and more of our contracts to full capitation. Our full cap contracts might be 20%, and some kind of risk would (constitute) a majority. MH: What roadblocks must be overcome for other systems trying to move in that direction? Skogsbergh: The first is a fundamental decision about whether you want to leave fee-for-service behind. That requires an awful lot of thought and consideration because fee-for-service healthcare has been pretty good to some of us, and the notion of stepping away from a system that's rewarded us financially is oftentimes counterintuitive. Fundamentally, organizations need to think through if this is the right move for their healthcare organization (and) in the best interests of their patients. Not everyone is going to embrace that. The final destination is better health outcomes, lower cost, better service. There are many different paths you can take to get there. There are some regulatory roadblocks that make it difficult to do that kind of integration. Advocate had over five years of review and investigation by the FTC (Federal Trade Commission) before it ever blessed our clinical integration model. MH: The FTC is challenging your acquisition of NorthShore. Why should you be allowed to integrate with NorthShore? Skogsbergh: I'm reticent to talk too much about the trial itself, obviously, because we're still in litigation. But the public record is pretty clear. We are anxious to merge with NorthShore to solve a problem that the payers and the employers have pointed out to us, and that problem is for us to take a low-cost health insurance product, which we already have in Chicago today, to a larger population. MH: The FTC says this will reduce competition and lead to higher prices. Skogsbergh: (That) is ludicrous. Anyone in Chicago knows how competitive this marketplace is. In any one of our markets, we've got three, four, five competitors, so we have difficulty understanding how it would significantly reduce competition. MH: We're seeing a merger being unraveled in Toledo. What would happen if the FTC were to win a preliminary injunction? Skogsbergh: If the FTC prevails, it will have a chilling effect on continued consolidation and collaboration. Don't get me wrong. Do I believe there's a role for the FTC to play in protecting consumers? Absolutely. (But) I believe it has misapplied all of its rules and regulations and models in this case because there is no harm to consumers. MH: If the judge grants a preliminary injunction, will you drop the whole idea of a merger? Skogsbergh: We will not proceed beyond this point. MH: The Chicago market has a lot of overcapacity. Is that a problem for you, or do you see that as more of a problem for other institutions? Skogsbergh: Overcapacity is very real for our entire industry. Part of it is because it's been built on this notion of bricks-and-mortar inpatient beds. Healthcare is changing. It used to be all about the hospital bed and the four walls. Today, healthcare is being provided in outpatient clinics. It's being provided in physician offices. It's being provided in diagnostic centers. It's being provided in the home. So, over the years, we've built up a tremendous investment in infrastructure, and we have hospitals that probably have too many beds. you sort of balance those two things? I'm one of those who still believes that with our continued advancements in medicine and in health, we will see more and more care being delivered on an outpatient basis, and our reliance on beds and bricks and mortar is going to continue to decrease. MH: You were a college baseball pitcher. If you were to describe your management style as a pitching style, what kind of manager are you? Skogsbergh: When I threw, or the pitchers I admired threw, they pounded the strike zone. First pitch, strike. You could translate that to execute. Figure out your game plan and then execute it. It's not that we at Advocate are any smarter than anybody else. But I will say that we focus on execution with a kind of laser-like focus. For us, it's really all about the care that we give. And we talk about being first and foremost a safe clinical enterprise. So for us, we just keep pounding that notion that it's about the care you give to patients, it's about safety, it's about health outcomes, and if we do that right, everything else will follow.